Fun fun and MORE fun! Our trip to Lancaster & Strasburg, Pa had so much going on-that I'm really just now getting the chance to reflect on the super fun we had. We started out at Strasburg Railroad (Read my info on that here) and our next stop was at Cherry Crest Farm. What a COOL place! When I think farm... I think.. animals, right? Well... kind of. These aren't just ANY animals. 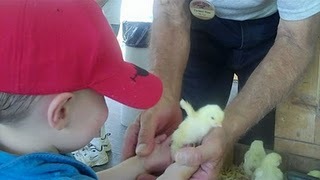 They are FARM animals-but Cherry Crest makes them super FUN FARM ANIMALS! I have to say-my fave part of our 100 degree holyhottness of an afternoon was when Boston held a baby chic. It was the CUTEST thing ever. I gotta admit-I'm not TOTALLY a germaphobe. I mean.. since I've become a mom-I'm more aware of it then before. And the thought of my kid touching a bunch of dirty animals? Yeah. I'm a bit of a priss. But I'll tell ya-they are PREPARED for whacked out over protective clean moms like me. They had a hand washing station right next to the petting area. Unfortunately, I had no idea that there was so much more on the OTHER side of the train tracks! There was so much to do. An unbelieveable amount of stuff to do with the kids. So you KNOW... Me and my bubba & Matty are heading back for a FULL day of fun! Check out the recap.... Fun Fun! OH- and when you go-you HAVE to check out their legendary Corn Maze!